Each year around the holidays it’s the same routine: pull out the decorations, untangle the lights, and test every strand to find the handful that have managed to burn out between this year and last. You might hang on to one strand for replacement bulbs but otherwise you don’t need the rest. What’s an eco-conscious person to do? 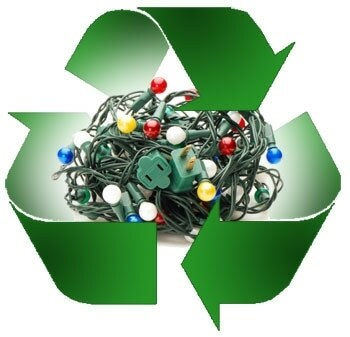 Lucky for us, DuPage County has a holiday light recycling program that’s been going strong for at least 7 years. Each year the program has recycled over 50,000lbs of holiday lights! Elgin Recycling partners with many of the towns to provide the seasonal program at no-cost. They provide bins for each location as well as pick-up when they are full. It is totally free for residents to participate. SCARCE and the Village of Carol Stream were the inaugural locations to bring holiday light recycling to the community. SCARCE has since collected holiday lights for recycling year-round. The program has expanded a whole lot since that first year. Check out the list of participating locations at the end of this post. Holiday lights are valuable for recyclers like Elgin Recycling because of the copper that makes up the strands. The plastic and the brass prongs from the plugs are recycled as well as small bits of metal from the rest of the strand. Light strands are put into a shredder and then sorted by material, such as glass, copper, and plastic. The amount that gets recycled from each strand has improved over the years. If you’re into the details, the Atlantic has an in-depth article on how holiday lights are processed. Recycling your lights not only saves landfill space, it also saves tons of energy – even more if you replace your burnt-out bulbs with energy efficient LED light strands. Because it’s already been refined, recycled copper requires up to 90% less energy to produce. Mining copper ores requires more energy and damages local ecosystems. It releases toxic gases too. Lastly, copper is a finite resource. It’s just practical to conserve and reduce, reuse, recycle it as much as we can. Bring any type of holiday string lights including LEDs, italian mini-lights, and rope lights – working or not – to one of the following locations for recycling. Hours and dates vary by location – please contact them for details.